Coming to mind right now is the story of two close friends named Damon and Pythias narrated in Oxford Reader book Five. Imagine a planned short trip from Lagos to Abuja, slated for only three hours, lasting virtually 12 hours stretch, part of which was seven hours wait at the departure lounge of the domestic airport in Lagos. The resultant stress (we are all human beings, whatever the age) majorly accounted for the absence of this column for two consecutive weeks. You are all on your own as age plays no role in facilitating, reducing or rescuing from the inevitable stress. It is therefore joyful to be back. While away, or to be specific, while struggling to be back on feet, Nigeria (next only to United States) remained the place of action fun, controversy and sensational development in the polity while the economy refuses to collapse. These are what set Nigeria apart, at least in Africa. One of which can best be described as fun and fury, the trial of Nnamdi Kanu, the Nigerian-born British leader of Independent People of Biafra (IPOB) took a new dimension for a long time after the trial began, Kanu was refused bail presumably on grounds of security. Such are political trials. After series of agitation and pleas by both his defence counsel and supporters, Kanu was eventually granted bail in the sum of one hundred million naira. And who was best placed to guarantee such bail then a National Assembly member from an Abia Senatorial District, Sen. Eyinnaya Abaribe. For an ordinary Nigerian, the sum of one hundred million naira might be whopping but the amount is not more than chicking feed for a member of Nigeria’s National Assembly, considering the earning capacity of those guys. Still, all suretees carry some risk even if merely routine in nature since, on the average, accused rarely eventually fail to show up for trial. But that was not to be in Nnamdi Kanu’s case. Rather miraculously, Kanu reportedly disappeared from his erstwhile fortress of a house in Umuahia. These generated series of speculations. Did Kanu escape from Nigeria? After all, he holds double nationality. Was he abducted by Nigeria’s security forces? If so, what had been his fate? Where was he? Meanwhile, Nigerian security forces denied abducting Nnamdi Kanu. Family, friends and associates raised alarm. Was his disappearance stage-managed? If so, towards what end? Was Nnamdi Kanu still alive? When trial resumed, Senator Abaribe, like any other suretee was expected to produce the accused but he (Abaribe) was helpless as he demanded the army should produce Nnamdi Kanu, the implication of which was that the accused was abducted from his house at Umuahia. The army denied holding Kanu. 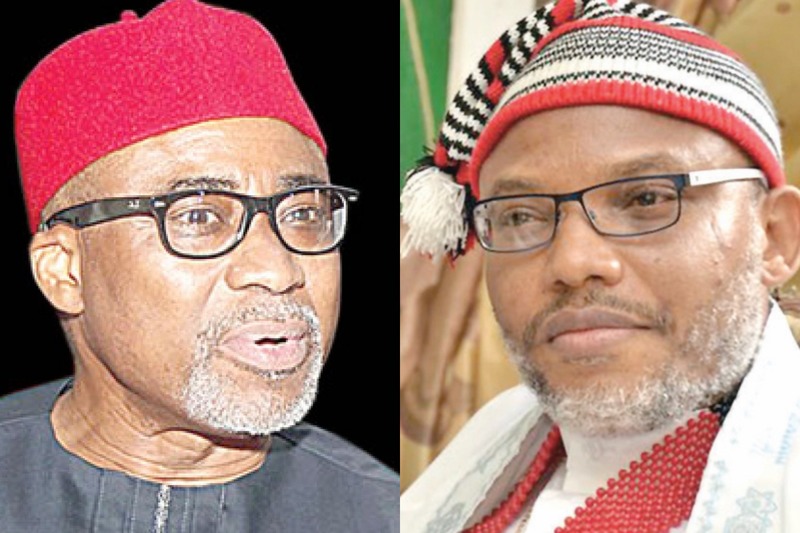 The court, insisting on the appearance of Kanu, adjourned the case several times while putting the onus on his suretee Senator Abaribe to produce the accused. Eventually, the court invoked its authority by forfeiting Senator Abaribe’s bail bond of one hundred million naira as suretee. Ordinarily, that is not more than ordinary dent on Senator Abaribe as, for a long time in the future, he may not be eligible to stand as suretee for any accused granted bail, provided he himself will ever take such a risk again, even for a blood relation. But, a more fundamental issue arises. The issue of trust among friends or even relations. At the root of any offer of suretee is presumed confidence that the accused will either voluntarily show up or be produced on the day of trial. After all, there were cases in the past where suretees withdrew their offer. No doubt, Senator Abaribe would be uncomfortable by the disappearance of Nnamdi Kanu whose whereabout, so far, is unknown, apart from the fact that he is alive. What effect will this episode of Kanu’s failure to show up have on other potential Nigerian suretees in the long term? There is no doubt about the liberal stance of the judge in this case, such that by the time he revoked Kanu’s bail and forfeited Abaribe’s bail bond of one hundred million naira, there could be no criticism. The end game was that Kanu could still not be produced. My generation could not help being touched by the Abaribe – Nnamdi Kanu affair for the avoidance of doubt, there is no proof Kanu deliberately breached trust of his suretee. But the fact of history as if now is that his suretee Senator Abaribe forfeited his bail bond on account of the accused’s failure to show up for trial. Those of us educated under colonial rule till today, benefit from such venture which instilled in as such everlasting moral instruction in various aspects of life. The breakdown of trust between Senator Abaribe and Nnamdi Kanu is a good example. Over 60 years ago, our texts in primary schools were mainly Oxford Reader Series for English language from Standard One to Standard Six. Coming to mind right now is the story of two close friends named Damon and Pythias narrated in Oxford Reader book Five. These were two good friends with complete trust in each other. Those were the days of strict regulations to maintain discipline in society. Indeed, a law had better not be violated than the culprit escaping. One of the friends, presumably Pythias, violated one of the village laws which carried the death penalty. The King was well-known for enforcing all regulations whoever the violator might be. But that was the first time an offence carrying death penalty would be tried in the village. Won’t the King execute Pythias and what might be the consequences? Trial went full swing and Pythias was allowed all processes of defence. Still, he was found guilty and sentenced to death. Everyone was satisfied the trial was fair and justice was done. A date was accordingly set for execution of Pythias in the village square. There was widespread anxiety. Pythias was from a distant part of the village and just at the last minute, he put up a request which seemed impossible. He requested to be allowed to see his friends and relations for the last time, much as he was prepared to be executed. But Pythias was shouted down by the villagers who prevailed on the King not to grant the convict’s request, because such request was considered a plot by Pythias to escape permanently from the death punishment. Pythias promised on his personnel honour to return and face the death penalty. Eventually, the King was torn between doubt sympathy as he demanded of Pythias to guarantee beyond verbal assurance to return to face the death penalty. Hoping for the impossible, the king then conceded that the only condition for Pythias to have his death sentence postponed on his return from visiting his people in his section of the village, was to produce a suretee who would volunteer to be executed if Pythias failed to return. Nobody might take such a risk, at least, so the king and the villagers thought. But Pythias had a surprise – a loyal friend Damon volunteered to stand in to be executed if Pythias failed to return for his execution. Damon seemed to have lost his senses in taking such a risk but such was the trust between the two friends. At that stage, the king not only granted the request of Pythias to visit his friends and people for the last time but also that Damon to be put in custody for execution in case Pythias failed to return. The duration of Pythias’ visit to his village and his people was to last a fortnight, the last day of which he must show up for his execution, or his friend Damon would be executed instead. The D-day came as hours reduced to minutes for the execution. Yet Pythias was nowhere to be seen. Immediately arrangement were made for Damon to be executed. Despite the hostility of the crowd and hisses on his widely assumed foolishness for allowing a death convict to escape while he would be executed, Damon continued to express confidence his friend Pythias would show up in time to face execution. Indeed, like a miracle, few minutes to execution time, there was pandemonium in the village square as Pythias emerged, pushing everybody aside until he succeeded prostrating before the king, who himself could not believe fast moving events. Six minutes later, Damon would have been executed. Instead, Pythias offered his gratitude to the King for allowing him to visit his people for the last time and pleaded for the release of his friend Damon so that he (Pythias) could face his execution. It was a moving scene for everybody not the least the King, who was completely disarmed by Pythias return at the last minutes. From the erstwhile hostile crowd developed respect and sympathy for Pythias in his courageous and honourable act of honouring his pledge not only to return and face certain death but more remarkably in saving his friend Damon who had volunteered his life as a suretee for his friend, Pythias. What would the king do next? To execute Pythias after honouring his pledge to return and (to) face death penalty? Instead, the king appreciated Pythias’ gesture with a surprising magnanimity. He ordered Damon to be set free from the stakes to enable the two friends embrace emotionally their mutual trust. Who should be more grateful? Pythias whose friend, Damon so trusted him to offer himself as substitute to be executed in case Pythias failed to return or Damon who trusted his friend Pythias to return to face his death penalty? Tears of joy on both sides. The King then appreciated both men. To Damon, the King upheld his courage and trust in staking his life for a friend, Pythias facing the death penalty. The King was even completely disarmed by Pythias’ faith in his friend, Damon, who stood in him for him as a death convict. The King then decided that based on his pledge to return in time to save his friend Damon from being executed in his place, Pythias should similarly pledge never to repeat the offence which earned him (Pythias) death penalty in the first place after which Pythias could go a free man. Pythias gave the pledge to the satisfaction of the King who then set both men free. There was no doubt Senator Abaribe meant well when he stood suretee for a constituent, Nnamdi Kanu. Again, the bond was not the issue. Abaribe might even have aimed (quite legitimately) at personal political boost back home when he offered to stand as suretee for Nnamdi Kanu. That gesture remains element of trust in fellow human beings. It is a gesture that must always be reciprocated.